We are cancelled on June 17th 2017, there will be no parkrun on the common on this date. please be prepared of us to call it off at the last minute, we do not take any risks with yours or our volunteers safety. Occupation: Former accountant, now just busy at home! 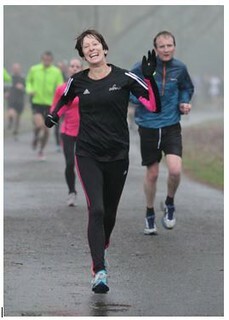 What do you do at parkrun: Run! and mainly here at Southampton but I have visited 22 other parkruns from Plym Valley, Newport, various London and Hampshire parkruns to Milton Keynes and Ipswich. I have also tried many of the volunteering roles - first timer briefing, lead bike, scanning and run director, oh and token sorting as I am quite good at counting! My favourite role is run report writer; I have enjoyed being able to reflect on many odd aspects of parkrun from running dogs to parkrun cakes and Christmas songs. How has parkrun changed your running: I started running at Eastleigh nearly 4 years ago. Before that I hadn’t run since school days! I found I improved steadily over the first few months and I enjoyed getting pbs regularly however they are much harder to come by these days! I know I need to train in order to run faster but it is great knowing that parkrun is there every week so even if I don’t get out during the week, I know I will run on a Saturday (obligatory in this house!). Recently I have tried longer runs including the Southampton half marathon earlier this year. I never thought I would make my 50 T-shirt let alone my 100 but now I have 200 in my sights so who knows where it will end! What do you like about parkrun: I have got to know a lot of new people locally and it surprising how many I bump into around and about the town. Every run I aim to find someone ahead of me to try and catch and was surprised when I learned that others were following and trying to catch me. This seems to me to be the essence of parkrun – everyone trying their hardest to beat their own time with the help and support of all the others around whether they know it or not! It is great to be able to run with everyone else, young and old, on an equal footing where everyone is pleased for everyone else! I try to smile and wave at the volunteers as I pass as I value their support and cheering but am too breathless to thank them! Most memorable or funniest parkrun moment: It is fantastic that Southampton parkrun has grown into such a popular and well run event. I have enjoyed the Christmas Day and New Year’s days runs and the double Netley Abbey/Southampton run a couple of years ago was memorable for the appalling weather that day – I looked even worse than in the above photo! The funniest moment was probably on Southampton’s inaugural run when a dog ate the celebration cake whilst we were all running!